Traveling abroad is a life-changing event. You might learn a new language. And you’ll definitely engage with a new culture; you’ll taste new foods, navigate a new city, and meet a variety of new people. If you want to spend longer than two weeks sightseeing abroad, there are plenty of opportunities for you. Don’t let finances be an issue. There are quite a few cheap travel abroad programs that will help you make it work without raising extra funds. When I studied abroad in New Zealand during college, I met tons of backpackers who were there on a working holiday visa. Essentially, these visas will allow you to work in the country for about six to 12 months with the expectation that you’ll leave after that time. You have to be 18 to 25 and have graduated in the last 12 months from a university ranked in the top 200 in the world to qualify for the Work Holiday Programme. The visa costs $150 and is good for six months. If you’re between 18 and 30 and a citizen of the U.S., you can apply for the USA Working Holiday Visa. 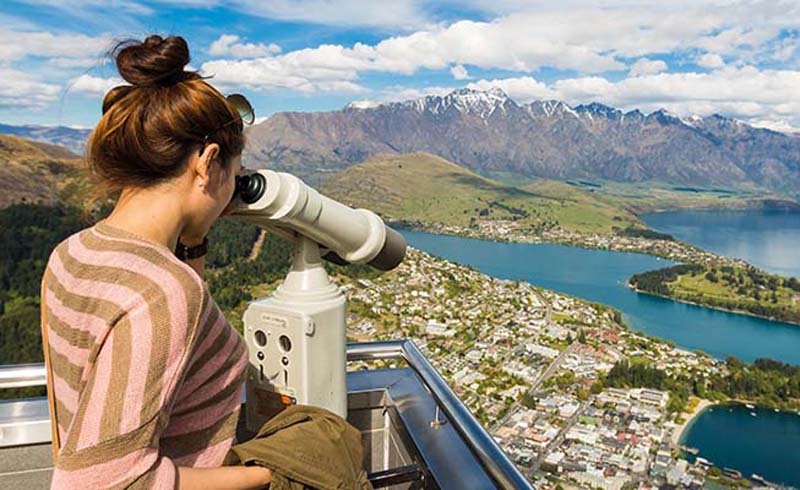 But even if you aren’t a U.S. citizen, New Zealand has similar programs for other nationalities. Check their website for more information. In order to apply for a visa, you’ll need to prove that you have medical insurance, $4,200 in the bank, and enough money to buy a ticket home. This visa costs $208 in New Zealand dollars (about $150 in U.S. dollars). Similar to the New Zealand Working Holiday Visa, Australia offers the Work and Holiday visa (subclass 462) for 18- to 30-year-olds. It’s valid for one year and costs $430 in Australian dollars (about $330 USD). You can work in plant and animal cultivation, fishing and pearling, tree farming and felling, or tourism and hospitality while you’re in Australia. You’ll also need to prove that you have sufficient funds in your bank account and the ability to cover your health insurance costs. If you want to check out South Korea, you can apply for the Working Holiday Program, which allows you to stay in the country for up to 18 months. You’ll need to be between 18 and 30, with proof that you have health insurance, about $2,600 USD in your bank account, and a return ticket or enough money to buy one. If you don’t have a ticket yet, sites like Travelocity and CheapO Air can help you snag deals. Keep in mind that if you plan to teach English, you’ll need a different visa. That the application costs $45 USD. Got your heart set on Europe? Both recent graduates and enrolled students can apply for a working holiday visa in Ireland. You’ll need proof of health insurance, a return ticket, and $4,000 USD in funds. An application fee costs $352 and $360. Instead of a working holiday visa, you can also apply for the following programs. Some require you to teach English, while others might provide opportunities in your field. The Peace Corps is a government-funded program that requires a 27-month commitment. You have the opportunity to work on projects in a variety of areas — agriculture, community economic development, education, and more. You’ll also receive housing and a living stipend. While there’s no application fee, you might need to pay for medical exams during the application process. After you serve, you’ll receive $8,000, and your student loans may be eligible for deferment or forgiveness. While you’re abroad, the Peace Corps will cover all transportation to and from your country of service, plus vacation days and medical coverage. After your service, you’re eligible for preferred hiring in the federal government, along with other career support and/or graduate school assistance. There are plenty of programs for teaching English abroad, but not all are created equal. For example, the JET Program in Japan is a highly competitive program that offers employment in teaching in communities throughout the country. Participants earn between $29,000 and $34,000 per year, depending on their experience and how many years they spend in the program. The program covers health insurance and travel to and from Japan. WorldTeach offers partially or fully funds teaching opportunities throughout the world. Their current programs are in Namibia, American Samoa, the Marshall Islands, Ecuador, and China. Fulbright is another highly selective program for U.S. citizens. Program offerings include Open Study/Research Awards, English Teaching Assistant Awards, and two special programs: the J. William Fulbright-Hillary Rodham Clinton Public Policy Fellowships and the Fulbright-National Geographic Digital Storytelling Fellowship. You need to hold a Bachelor’s degree, and you can’t have lived in the country you wish to visit for more than six months. You’ll receive round-trip transportation to and from the country, funding for room and board, and health insurance while abroad.